What is a vaccine and how does it work? How are vaccines made? Who discovered vaccines? What diseases do vaccines prevent, are these vaccines effective, and are they safe? 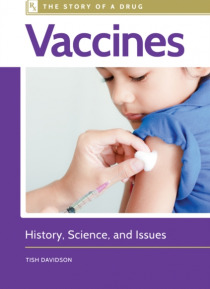 Presenting comprehensive information on a topic that remains the focus of considerable controversy, Vaccines: History, Science, and Issues provides readers with a single-volume examination of vaccines and their history, product… ion, uses, and limitations. Written in language that avoids intimidating medical jargon, this latest addition to Greenwood's Story of a Drug series looks at different types of vaccines and documents the value of vaccination to society. It explains the process of developing a vaccine, the testing required before it can be distributed to the public, and the challenges that arise in manufacturing and distribution, along with potential solutions to some of these problems. Readers will gain insight into vaccination-related topics such as the legal issues surrounding mandatory vaccination, the relationship between vaccines and adverse events, and the government's role in adjudicating claims of damage. The book also includes international recommendations from the World Health Organization and information on vaccines that are available and used outside the United States.